I really wish someone would've warned me that this was a psychological thriller. It was a great film and for reasons I'll explain in a subsequent post, it hit freakishly close to home. Still, there were several cringe-worthy parts that I just couldn't bear to watch. 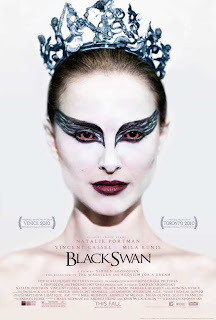 Black Swan stars Natalie Portman as Nina, a budding ballerina who pushes and pushes herself toward perfection, namely the Swan Queen role for her company's Swan Lake production. Thing is the person who lands the role must be able to play both sides to the queen and while Nina embodies the innocence of the White Swan, Lily (played by Mila Kunis), a feisty new rival, is the epitome of sensuality and seduction, the Black Swan personified. What develops (or deteriorates) in Nina over the course of the film made me squirm not only because of the gnarly bits but because for two hours I felt like I was watching pieces of my own life play out on the screen. From the beginning, the movie is in your face. The close-up shots almost feel uncomfortable and I just wanted some distance between the characters and me, but it only intensifies as the plot grows darker. Still, as much as I hate being scared and grossed out, I enjoyed the film for its story, direction and incredible acting. Nina's role seemed hard to pull off convincingly, but Portman made it so believable. Then again, I'm probably completely biased because when you relate to a character as much as I did, you're pretty much sold as soon as you feel that connection with them and Portman dragged me with her almost to the very end. Doesn't sound like my cup of tea, but I'm glad you liked it. Nice review. I think you've talked me into going to see it! Thanks for the review, but I honestly think I couldn't be less interested in this. I am quite certain I would not appreciate it like you did. You've also talked me into seeing it, but I might have to wait for DVD. Ps Mila is nice to look at too. But I can't take her seriously when I see her on the screen - I keep seeing Meg Griffin of Family Guy. So I took the boo to see this yesterday and although your post prepared me a bit I was still creeped the hell out. I don't like scary movies and I thought for sure I would have nightmares last night. I enjoyed the fact that one had to decipher which scenes were real and which ones were her imagination/crazed perception. But some parts of it didn't make sense in the realistic sense- and the one HILARIOUS part of the movie was when she took the first homework assignment to her bed. I was literally laughing for 5 minutes straight.